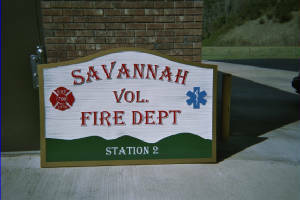 The Savannah Volunteer Fire Department was organized in June of 1978. The members held the first meetings on Monday nights at the old voting building across from Tathams Creek Road. When the four lane (US 441) was built and the voting building demolished, the meetings were then moved to Cabe's Amoco across from the Old Savannah School. The land where Station One is located was donated in 1979 by Tommy Sutton. In 1983, with the assistance from the Jackson County Commissioners and the State Of North Carolina, funds were obtained to build the fire station. The firemen did much of the work, including filling in the property so the fire station would be level with the highway. Since that time, we have constructed two additions to the building in order to accommodate the increase in our fleet of fire trucks and equipment. We currently have eleven fire trucks serving the Savannah community, with nine being at Station One. The first Chief was Lloyd Green, who served from June 1979 untill April 1980. Due to his employment, he was required to move away from the area for a period of time. Barry Bateman served as the second Chief from April 1980 untill October 1984, who also moved away due to work. Darrell Woodard was elected as Chief in October 1984 and continues to hold the position at the present time. In April 1979, the department held its first annual fund raiser, "The Ramp Dinner" this first dinner was served to approximately 200 people. In 2002, the 23rd annual Ramp Dinner served 2,300 people, using approximately 110 gallons of cleaned bulb only ramps, "That's a lot of Ramps". This dinner was an annual event untill the 25th anniversary in 2005. At that time it became increasingly hard for the department to obtain enough ramps to supply the many patrons and due to new federal laws restricting the digging of ramps. The dinner was changed in 2006 to a bar-b-que dinner. The medical first responder program was started in 1995. We currently have 24 members who are trained in medical care. The first responders all carry medical equipment with six carrying defibrillators. These members respond to assist the local Emergency Medical Services personnel during medical emegencies. The department currently has 42 full time members. We also have a junior firefighter program for young people ages 16-18. In addition, we have a chaplain who assist us and family members with any tragic incidents we might encounter. The substation on Pumpkintown was built to provide fire protection to the residents that live beyond the six mile limit from station one. The property was donated to the fire dept by the Pumpkintown Community Center. The building was completed in late 2007. The building is a 50' x 50' metal building, with brick veneer. The building has three bays with office, bathroom and overhead storage, and currently houses three fire trucks. Our future plans include building a second substation near the entrance to Greens Creek road.